Shown is a small SUV that struck a home Wednesday morning on Pea Ridge Road. There were no injuries reported late Wednesday morning when a small SUV struck a home on Pea Ridge Road near North West Street/SR 73. James Grisham of Hillsboro was the driver of a Chevrolet Tracker that was eastbound on Pea Ridge Road when it apparently drove off the right side of the road and into a yard, striking a brick home so hard that the vehicle bounced roughly six feet to the left of where the impact occurred, coming to rest at the corner of the house, according to officials at the scene. 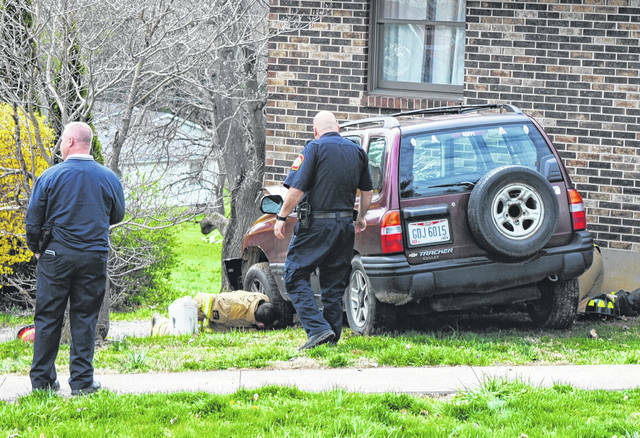 Lt. Branden Jackman, public information officer for the Paint Creek Joint EMS/Fire District, said Grisham was not injured, and that it was unclear why the vehicle drove off the road. Officer Brian Butler of the Hillsboro Police Department said Grisham may have been distracted behind the wheel. Butler said Grisham will be charged with failure to maintain control. Paint Creek Chief Dave Manning said Grisham was the only person in the car and the home was not occupied at the time of the accident. Jackman said city crews had to shut off water to the property because the vehicle knocked a water spigot off the side of the home. Authorities remained on the scene shortly before 11 a.m. cleaning up a possible gas leak from the vehicle’s engine.